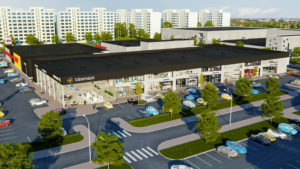 Tähesaju Business Centre will be completed in Tähesaju City in the first half of 2019. 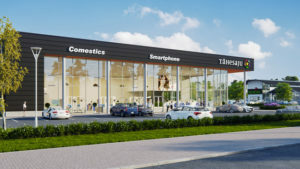 The location of the building next to Tähesaju Street is exceptionally favourable in terms of logistics, Selver opened its new supermarket in the neighbourhood and Hortes Garden Centre will open its doors there in 2019. This is a commercial building that has premises for shops, offices and warehouses. It is perfect for companies that want to be visible, easy to access by clients and have the different parts of the company under the same roof as the sales unit. There is a car park for tenants and clients with more than 100 spaces in front and next to the building. The building was designed by Arhitekt Tarbe OÜ.